When most of us think of champagne and caviar, images of royalty, excess, the rich or just opulence appears but does hair come to mind? Probably not and for good reason. Both caviar and champagne are mainly for consumption but as we delve into the benefits of different types of foods, we will learn they have amazing results for our bodies. There is nothing better than delicious food that is good for you, especially when they are delicacies or alcohol. Champagne is sparkling or carbonated wine that is produced in the champagne region of France. It is produced from highly specific varieties of grapes like chardonnay, pinot noir, and pinot meunier. The extraction methods that minimize contact between the juice and the skin of the grapes are what make it turn into a white wine. Champagne gets its unique bubbles from the wine undergoing a secondary fermentation process within the bottle and the gasses produced during this second fermentation and create the sparkling or carbonated effect. What makes Champagne good for your hair? This well-guarded secret is really not a secret at all…if you know the right people that is. Just ask Joel Warren of the posh New York City Warren-Tricomi Salon where champagne is not just for sipping. Joel explains that champagne is an excellent hair treatment for helping your tresses achieve smoother and silkier hair. The bubbly is perfect for blondes because it enhances the golden tones and highlights, but it will boost shine in all hair colors and the carbonation will add volume. Have you ever purchased a bottle of champagne that you hated? Well, make an easy hair rinse! After shampooing or co-washing, apply the mixture of the champagne with hot water and distribute evenly throughout your hair. Allow it to sit for a few minutes before rinsing and styling as usual. Another trick to use with champagne is adding volume to your heat-styled hair. For extra lift, spritz champagne directly onto your roots before blow-drying your tresses. To put it plainly, caviar is fish eggs or fish roe, and not every fish makes caviar, which is known to be expensive. Sturgeon, the lumbering, toothless fish with the prehistoric appearance has its eggs harvested for caviar. The eggs are filtered to remove the fatty tissues and membrane and lightly salted with non-iodized salt. According to the U.S. Food and Drug Administration, true caviar comes from only the sturgeon even though any unfertilized eggs of nearly any female fish can be eaten. What are the benefits of caviar for your hair? These fish eggs contain vitamins and minerals that are intended to nourish the unborn fish. Caviar is a rich source of vitamin A and vitamin D along with omega-3 fatty acids. Vitamin A helps to produce healthy sebum, which will prevent your hair from drying out and breaking off. A deficiency in vitamin D may lead to hair loss and omega-3 fatty acids may help reduce hair loss. It also has zinc, which is essential to your immune system and strengthens the hair follicles to help prevent certain types of hair loss. 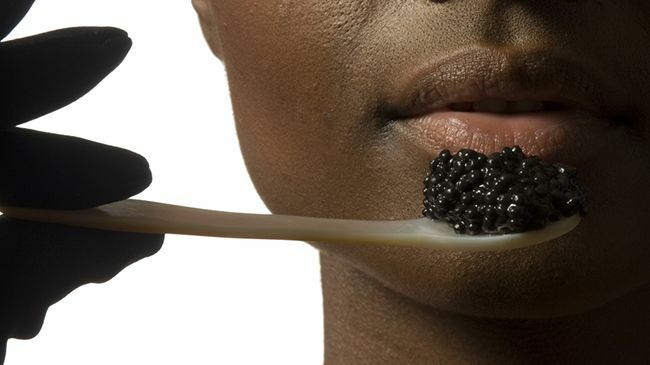 Now, just eating caviar to obtain these benefits may not be the best way to get its nutrients to your tresses because caviar is high in calories and salt. Do not fret because there are several hair products on the market that will allow you to reap the rewards without stretching your waistline or your blood pressure by overindulging. Two popular products with caviar extract come from CURLS and ALTERNA. CURLS Champagne & Caviar Curl Elixir - with soybean oil, virgin coconut oil, ethylhexyl palmitate (fatty acid), champagne extract and caviar extract you get a growth enhancing, hair strengthen treatment that will give you the sheen from the champagne and the hair growth potency from the caviar. ALTERNA Caviar Anti-Aging Overnight Hair Rescue- the caviar extract in this overnight hair rescue will help to repair your hair while you sleep. No greasy residue on your pillow or sheets and it is deeply penetrating. To my fancy curlies and coilies, have you tried products with champagne or caviar?